The stylish Stratos 3000 Compact seat features a seat cushion which allows for ease of entry and exit and an ultra comfortable integrated lumbar support. The 3000 series backrest provides optimal lateral support and it's Sisiara energy absorbing base system lessens driver fatigue and ensures you have a comfortable journey. 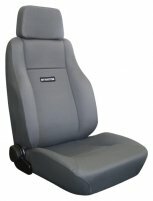 A seat for the true four wheel drive enthusiast. Side blosters on side backrest. One piece base cushion for ease of entry.